A collection of seven games that is sure to make any decimal unit fun and exciting! One of the best ways to have a deeper knowedge of math is to have discussions about it. 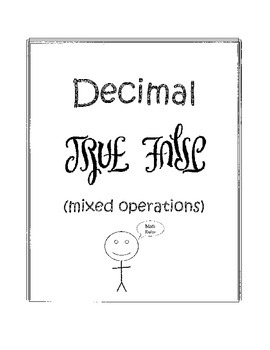 "Decimal True False Sort" gives the students the opportunity to discuss solving deciamal problems (addition, subtraction, division, and multiplication included) while deciding which statements are true and which are false. 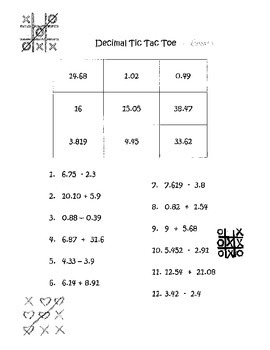 This is a great Common Core activity that incorporates many of the Standards for Mathmatical Practice. 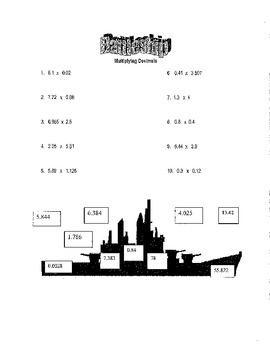 Example statments include: "When dividing decimals, your divisor may not have a decimal", "10 - 1.234 = 8.766", and "it is ok to use a decimal and a remainder for one answer". The questions on Board A have answers on the bottom of board B (and vice-versa). Students take turns solving a problem and telling their partner an answer. If the answer is on the ship (or bird), its a hit! If the answer is around the ship/bird (in the water), its a miss! The first person to sink their opponent's ship/hit all birds is the winner.